After hitting 5 million downloads and #8 in the Top Charts just under a week ago, Allo is now falling fast. As of writing this, it is in 86th, but was 75th a few hours ago and, according to this tweet, 62nd earlier yesterday. This probably shows that after millions downloading it during the initial release and hype period, that has now passed and the number of downloads has fallen dramatically. As you can probably infer, this is most likely not good for Allo's adoption rates. Looking at my personal contacts list, I have 9 contacts who have set up an account, out of 100+ phone numbers I have on my phone. These 9 are all 'techy' people - i.e. the market that was hyping Allo before release. So, anecdotally, no one I know who is not interested in technology has downloaded Allo so far. (As for Allo's sibling, Duo, I have a grand total of 1 on there, and that's an Android developer.) Even out of my roommates or closest friends, nobody has been interested in downloading or using either, despite me plugging it and telling them, even showing them, Google Assistant. What does this show? I'm not really sure. It's going to take time for Allo (and Duo) to penetrate the market, but I'm worried it's a case of 'too little, too late' for Google. It doesn't help that the two apps are only available on phones, and can not be used either on the web or as a desktop app. 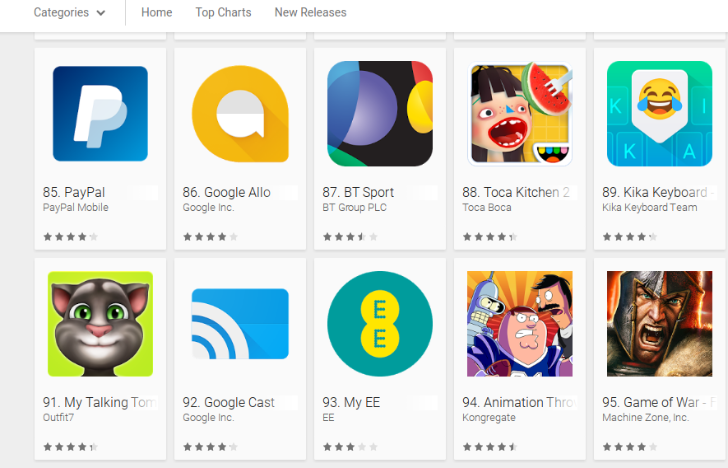 Either way, Allo was going to fall out of the Top Charts at some point, but it's somewhat disappointing to see it falling quite so fast.